Ariocarpus retusus LRM209, a large plant near Monclova. 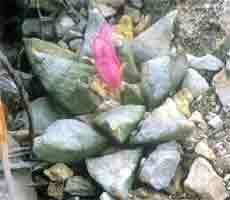 Ariocarpus retusus LRM209, the root has been exposed and chewed by animals. 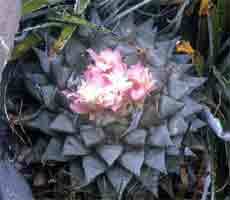 Ariocarpus retusus LRM209, a young plant with a very high content of pink pigmentation in the flower. At the northern end of the distribution of A. retusus, the plant continues to exhibit the wide variability inherent in the species, apical areoles may or may not be present, pink tinged flowers also frequently occur. 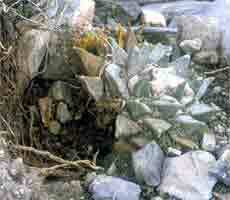 Plants here were large up to 25cm in diameter, and occurred mainly on the higher south facing slopes. Root damage, probably due to rodents, similar to that seen in A. hintonii at Matehuala was observed on one specimen at this site, similar damage has also been seen on A. trigonus in the Jaumave Valley.